Our WooCommerce Product Table plugin fully supports custom fields. You can create custom fields for your products and display them as columns in a table. If you’re selling event products then you can use custom fields to store the start and end date. Maybe you want to display the price in a different format. 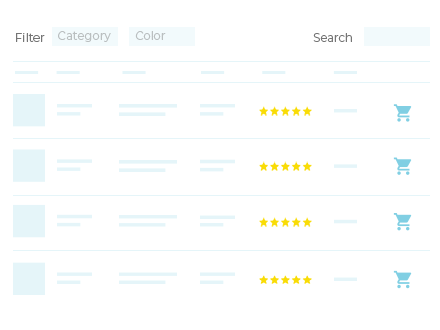 Using a custom field gives you more flexibility than the built-in ‘price’ column. You can use custom fields to add extra links or buttons, for example to download technical data sheets about each product. You can also use custom fields to add embedded content such as audio or video players. Please note that custom fields are designed to store unique data, and are not designed to be filterable. If you want to store extra information that your customers can filter by, then we recommend using custom taxonomies instead. You need to install a custom field plugin in order to create your custom fields. We guarantee compatibility between WooCommerce Product Table and Advanced Custom Fields (ACF) and Advanced Custom Fields Pro – these are the most popular custom fields plugins. Use the official ACF documentation to create your custom fields. When you create your custom fields, make sure you select the ‘Products’ post type. This is essential to make the custom field appear on the Add/Edit screen for your products. We have also tested WooCommerce Product Table with other custom fields plugins including Pods and Toolset Types. Once you have created your custom field, use these instructions to display it as a column in the table. You can create as many custom fields as you like, and list each one as a separate column. If you are adding shortcodes to a custom field – for example, to insert a button, embedded audio player or ‘Add to Wishlist‘ link – then you must enable the ‘Shortcodes‘ option in WooCommerce Product Table. This tells the plugin to display the content of the shortcode correctly in the table.